One of the most commonly confused concepts in 802.11n is the use of multiple input, multiple output (MIMO). There’s a ton of technical detail to understand in 802.11n, and for everyday network management, most of it is beyond the realm of necessary information. For us non-degreed engineers (what I call a pseudo-engineer), it’s easy to get lost in the numbers, formulas, and diversity schemes of 802.11n, but MIMO is a basic concept that networking folks should understand well. What I have found over the past few months is that many people “get” the idea of MIMO in the sense that it is an important part of 802.11n that provides multiple antennas and allows multiple spatial streams and transmit beamforming, among other features. 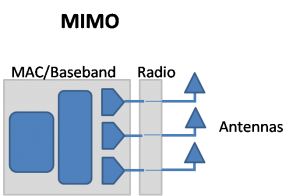 But what many people can’t articulate is that MIMO is a radio architecture with multiple radio chains for each radio chip. The most common misconception is that 802.11n is MIMO. But, MIMO and 802.11n are not synonymous. This is simply to say that 802.11n contains a huge set of technologies, but only a portion of them use MIMO, and you can have 802.11n without MIMO. IF 802.11n equipment supports MIMO, the MIMO architecture is described as AxB (e.g. 3x3 or 2x2), where either A or B MUST be two or higher. If an 802.11n device, like the iPhone or low-cost APs, is a 1x1, this is not MIMO. A 1x1 radio is single input, single output (SISO), but it can still be 802.11n. 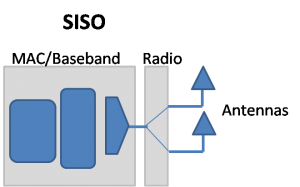 All 802.11a/g radios are SISO, and 802.11n radios can also be SISO. Also, remember that MIMO is not purely about antennas. 802.11a/g APs can have multiple antennas too, but their radios are not MIMO. 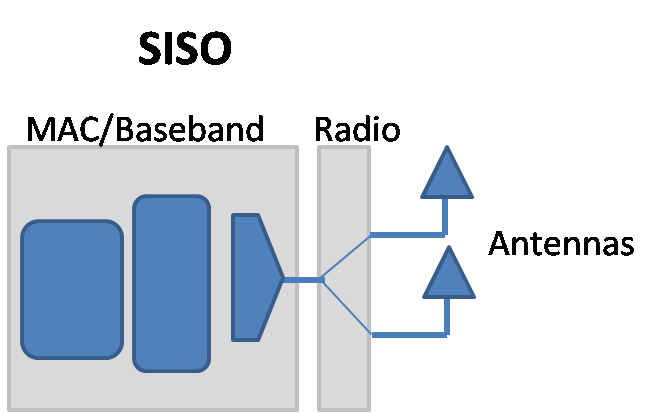 A SISO radio does not have multiple radio chains; it has just one radio with a single set of transmit and receive radio components (amplifiers, mixers, filters, ADC, etc.). One radio can switch back and forth between two different antennas, choosing the best air interface for incoming or outgoing frames. Using multiple antennas with a single radio is called simple or switched diversity. The image below is a quick sketch of a SISO wireless system. Notice that there is one set of radio components and both antennas connect to that same set. 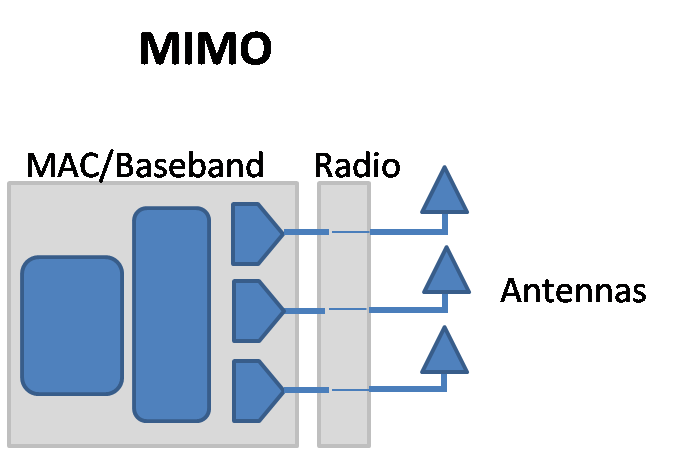 MIMO has multiple radio chains (with a set of radio components for each chain) and one or more antennas tied to each radio chain. The radio chains and their antennas are a part of the same radio system, but they can both be used at the same time with features like spatial multiplexing, transmit beamforming, or maximal ratio combining. My quick MIMO sketch is below where each antenna connects to its own set of radio components for simultaneous use. Remember, quick sketch. The relationship between MIMO and 802.11n is often confused because so many articles begin the discussion about 802.11n by talking about MIMO. Journalists are right to do so because MIMO provides many important enhancements. However, did you know that you can still achieve 150 Mbps connectivity rates in 802.11n without MIMO? So, tell your friends and co-workers to stop equating the two. And if you’ve told them once, the next time they use these terms synonymously, punch them in the face…with both hands at the same time.